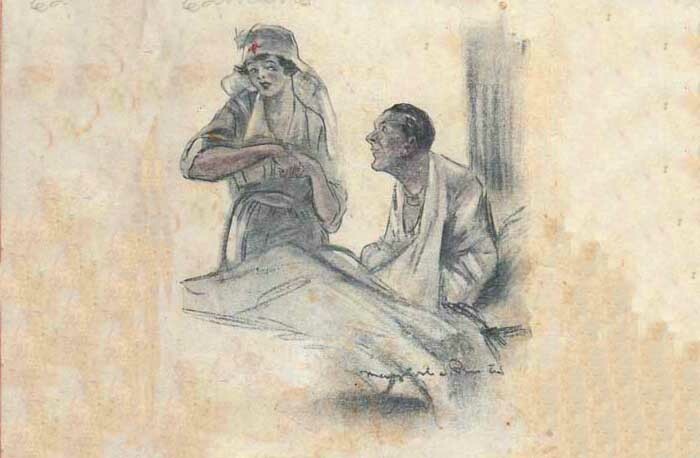 “And I wished you could see her look at me, Al.” Illustration by American artist May Wilson Preston (1873–1949) for the story “Simple Simon” in the collection The Real Dope (1919). Preston’s drawing was also used for the front cover of the book’s jacket. 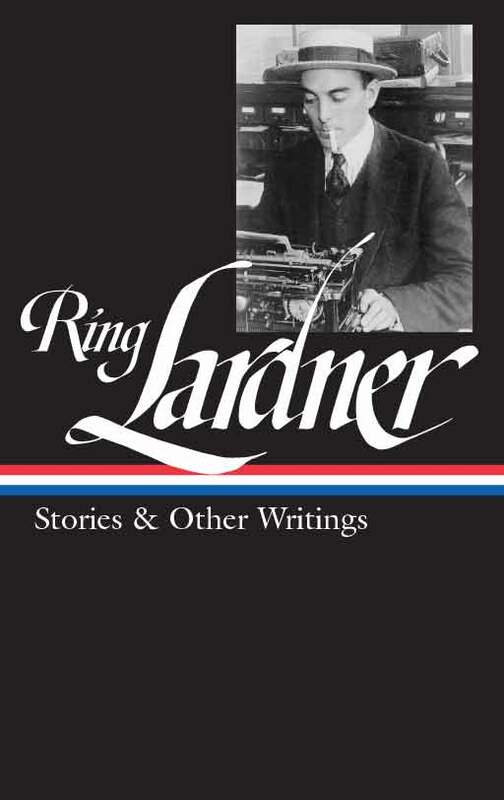 Ring Lardner had been working as a sports journalist for a decade when, in 1913, he began writing sketches about fictitious baseball players and sharing his drafts with his colleagues at the Chicago Tribune. The newspaper’s Sunday editor learned of Lardner’s efforts and offered to consider his first story for the paper’s feature section. Lardner submitted “A Busher’s Letter Home,” featuring Jack Keefe, an uneducated, likable, gullible, and somewhat hapless minor-league player. Lardner adopted a daring approach; the entire story was written as a series of letters, filled with Keefe’s slang, misspellings, and malapropisms. Worried that readers wouldn’t endure the unusual prose style, the Tribune editor turned it down, so Lardner decided to send it to George Horace Lortimer, the editor of The Saturday Evening Post, who accepted it for publication. It appeared in the March 7, 1914, issue and would be the first of twenty-six stories starring Jack Keefe. What is not in dispute is that Lardner made off quite well from the initial rejection. The Tribune editor had offered to pay $50 for Lardner’s first work of fiction if the paper ran it, but the Post paid $250 for it—and for each of Lardner’s early offerings. Nine of his stories (including six Jack Keefe installments) appeared in the Post before the end of 1914 and by the time the last Keefe selection appeared in 1919 Lardner was earning $1,250 per story. Somewhat to Lardner’s surprise, the Jack Keefe stories earned literary respect and critical acclaim. Perhaps the most unexpected among his many fans was Virginia Woolf, who stumbled upon the stories a decade later and ended up including Lardner in a review essay on new American authors.
. . . Mr. Lardner has talents of a remarkable order. With extraordinary ease and aptitude, with the quickest strokes, the surest touch, the sharpest insight, he lets Jack Keefe the baseball player cut out his own outline, fill in his own depths, until the figure of the foolish, boastful, innocent athlete lives before us. As he babbles out his mind on paper there rise up friends, sweethearts, the scenery, town, and country—all surround him and make him up in his completeness. . . .
“It is easy to speak English badly,” Lardner biographer Donald Elder reminds us, “but very hard to make a literary style out of bad English.” Book critic Jonathan Yardley, who also wrote a biography of Lardner, explains, “Ring was trying to be both funny and accurate. He was also trying to get down on paper the words of a man who wrote the same way he talked.” One aspect of this prose technique that has received particular attention from critics is the pattern of Jack’s misspellings. Lardner explained to his editors that, on the one hand, someone like Jack would believe in his own ability to spell the simpler words, but overconfidence would lead him to spell some familiar words the way they sounded. On the other hand, he would feel the need to look up or to ask how to spell the harder words. Fifteen of the Jack Keefe stories were subsequently gathered in three book collections. The first, and most famous, is You Know Me Al (1916), which gathered the six “Busher” stories published in the Post in 1914. Two years later, when the United States entered World War I, the market hungered for war stories, so Lardner transferred Keefe from the baseball diamond, via the draft, to the Army. The three selections in Treat ’Em Rough (1918) describe life in basic training, while the six episodes in the final collection, The Real Dope (1919), take Lardner’s hero to the war in Europe. The stories in The Real Dope were informed by Lardner’s eleven-week assignment as a war correspondent in France, where he saw little in the way of actual combat—much like his hero, who spends all six episodes “crazy to get up there to the front” to experience “some real actions.” While they wait in boredom, Jack and his fellow soldiers spend most of their time playing pranks on each other and especially on Jack. In the book’s final story, “Simple Simon,” the soldiers redirect the focus of their shenanigans to someone even more clueless than Jack, while Jack himself finally sees some “actions”—although not quite of the type he was anticipating. Notes: In the second letter Jack mentions Guy Meyer, “the French ace,” who real name was Georges Guynemer, a fighter pilot credited with destroying 53 enemy aircraft before he was killed in action in 1917. He also jokingly refers to German military leaders Paul von Hindenburg and Erich Ludendorff, who together directed the German army from April 1916 through the end of World War I. The German speegle mentioned on page 282 is a mirror (from the word Spiegel). John J. Pershing (page 283) was commander of American Expeditionary Forces during World War I. French military leader Ferdinand Foch was appointed supreme commander of the Allied armies in March 1918. Charles Comiskey (page 292) was ballplayer, manager, and owner of the Chicago White Sox. The story’s final paragraph describes the outset of the Second Battle of the Marne (July 15–August 6, 1918), a German offensive halted by the Allies in the vicinity of Reims, after which the Germans were driven back by an Allied counteroffensive. The Allied victory was of decisive importance for the outcome of the war. FRIEND AL: Well Al we have been haveing a lot of fun with a bird name Jack Simon only the boys calls him Simple Simon and if you seen him you wouldn’t ask why. . . . If you don't see the full selection below, click here (PDF) or click here (Google Docs) to read it—free!